Just in time for the start of the college football season, Nissan is breaking its annual Heisman Trophy-related campaign. Newcomers to the campaign include 2017 Heisman winner Baker Mayfield (Oklahoma University), Auburn legend Bo Jackson and Gino Torretta (Miami, 1992). The season’s first spot, “Calling All Heismans,” features Charles Woodson leading the charge. It debuts Aug. 30 on ESPN during the college football season opener, Purdue vs. Northwestern. The Nissan Heisman House is a fictional fraternity that provides fans a glimpse of what it might be like if the winners of college football's highest individual honor lived together under one roof. Nissan credits agency TBWA\Chiat\Day for coming up with the concept after hearing 2009 Heisman winner Mark Ingram refer to the group of winners as a fraternity during an awards ceremony speech. TBWA has worked on the campaign every year, says Erich Marx, director, marketing strategy and content, Nissan model line, at Nissan's U.S. sales and marketing organization. ESPN is the lead for production. The research repeatedly shows that the campaign, which is an overall brand campaign first and a vehicle model campaign second, has tremendous reach. The campaign supports Nissan's now 13-year sponsorship of the Heisman Memorial Trophy Award and the Heisman Trophy Trust. It features 10 Heisman Trophy winners in seven 45-second spots and five 15-second spots running throughout the college football season. While past years’ efforts have featured numerous Nissan vehicles, this year’s focus is on Nissan Intelligent Mobility and the Titan pickup, although there will be appearances by the all-new Altima, all-new Kicks and Rogue. New this season will be a series of animated GIFs of each Heisman winner for fans to share socially and via text. The GIFS for each player are likely to appeal to not just their college fanbase, but also their past or present NFL affiliation. For example, the Baker Mayfield GIF is likely to be shared by Oklahoma University fans, as well as Cleveland Browns fans. “It’s just a second bite of the apple for us to add reach to this campaign,” Marx says. Nissan also announced two sweepstakes, including one that offers a chance for a member of the public to win two tickets to attend the exclusive Heisman Trophy Award Ceremony in New York on Dec. 8. Fans also can enter to win a customized Nissan Titan. Last year nearly 1 million consumers used the configurator on NissanUSA.com to customize a Titan in their favorite school colors. 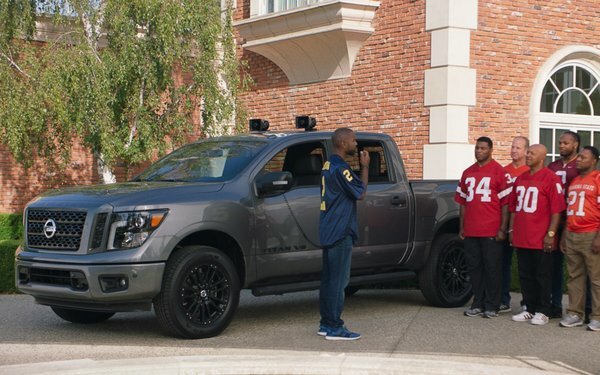 As in previous years, the Nissan Heisman House Tour, featuring a simulated Heisman House, will travel to different college campuses throughout the U.S. The tour's first stop will be Sept. 1 in South Bend, Ind., for the Michigan vs. Notre Dame matchup.